* The sequined felt tree skirt my grandmother made for my father when he got married. Over the years a candle melted on it, staining it red, and the felt ornaments fell off. My mother valiantly tried to save bits and pieces, as she knew how we looked forward to seeing it each year. 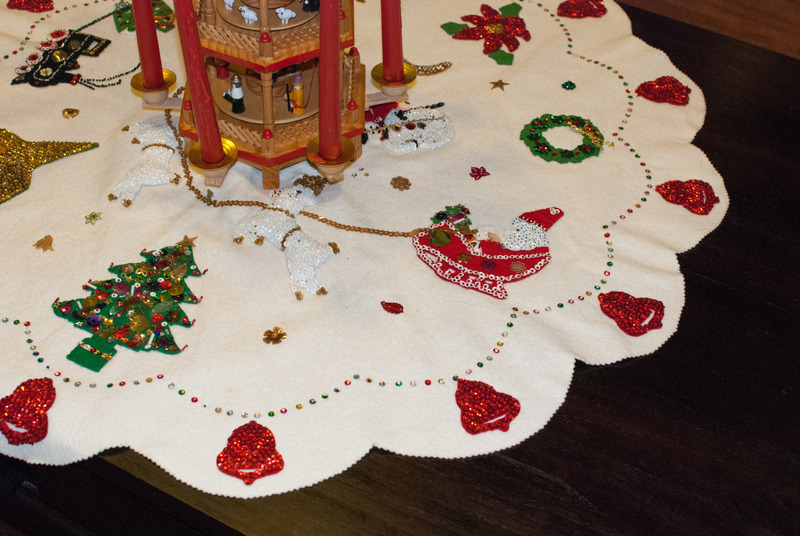 When my grandmother died we found an identical, pristine tree skirt among her linens. 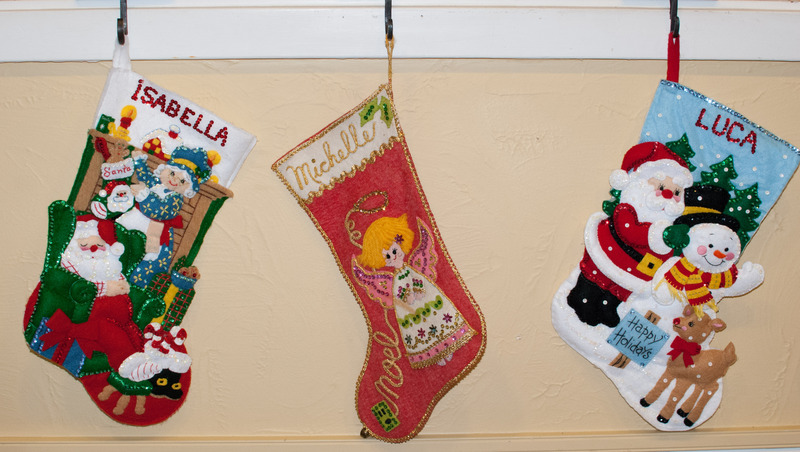 * The stocking made for me by my other grandmother. She made one for each of her grandchildren, as my mother did for her grandkids and I will do for mine. * The tin of French cookies about to be mailed. My grandfather used to make them at Christmas time, two at a time, in a handmade cookie iron. My father ate them as a child, as did my siblings and I. After my grandmother passed away, I took on the role of French Cookie maker for the family. 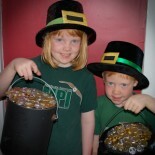 My kids and I make them and send them to the cousins on the mainland each year. 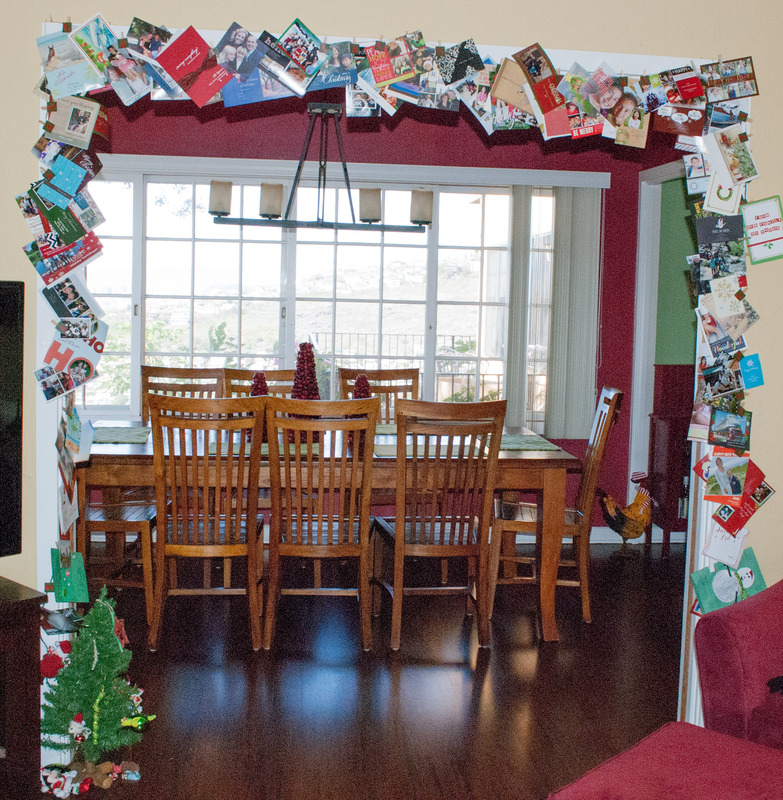 * Christmas cards from family and friends, framing the doorway – just like Grandma used to do. * The nativity scene I had under the tree as a child. When my mom passed away this was one of the most meaningful items I inherited. My mom added a giant pine cone “tree” that I decorated with beads as a kindergartener. When Isabella was in kindergarten I had her decorate a pine cone with beads. This year my kindergartener Luca made one one. Their pine cones are now both attached. My mom is smiling down at that one. 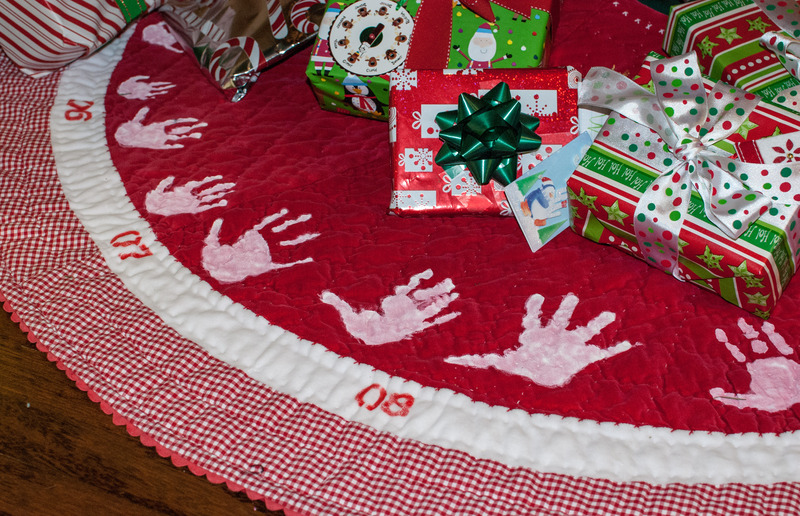 * Our tree skirt with the kids hand prints painted on each year. I use white acrylic paint and have each child practice on paper several times before adding their hand print to the skirt. I stencil the year in below. 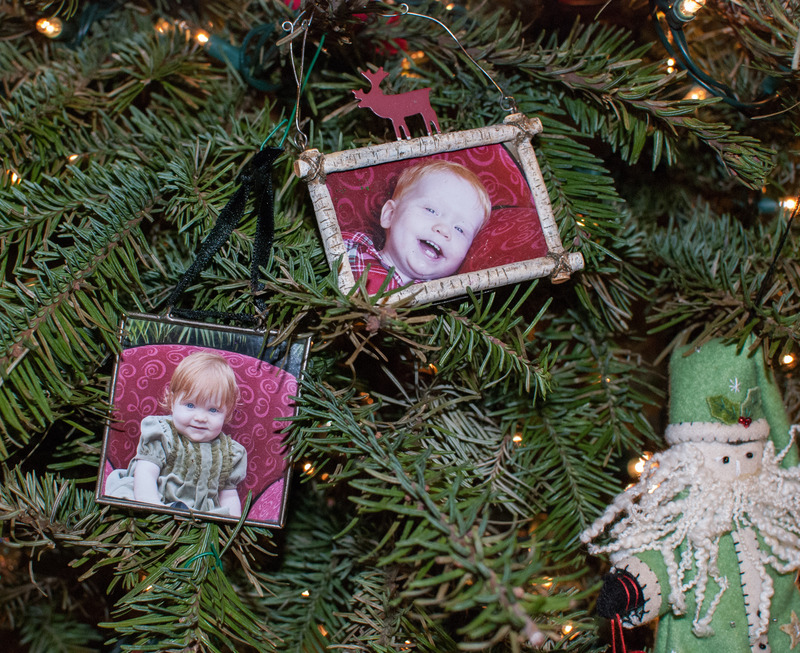 * Framed photos of each child, from each year’s Christmas card photo session. The intent was to collect them through the years then give them to my children once they marry and start their own families. This may perhaps be more easily said than done. I love these photos. Perhaps I’d better make back up copies for me! * We also collect an ornament or two each year for the kids. If we take a trip to another city we select an ornament or small souvenir that can hang as one. Some years it’s simply an ornament that is meaningful for us all, such as the beloved dog Max from The Grinch Who Stole Christmas. I keep a list of when and where they were purchased. I buy three. I hang one on the tree each year and tuck the kids’ away for later. I’ll be able to hand them a box of memories when they move out, to decorate their first tree away from home. He went on to explain that each year on Christmas Day everyone records their wishes and predictions for the new year, as well as their accomplishments for that year, then tucks the slip of paper away until the following year. Of course, you also read the previous year’s slip and see how you did, prediction-wise. I have not yet shared this with my family. It’s been a private tradition for me for the past 13 years, but this year I think I’ll share. I noticed that when we make our Thankful Trees each November and I leave slips of paper out for family members to indicate what they are thankful for, we all tend to notice what we are thankful for! So, if we keep this box out all year, perhaps we will notice newsworthy events like losing teeth, “kudos” at work, trips taken, special visitors, and, quite possibly, events my kids consider important that I would have overlooked. We’ll tweak my brother’s “directions” a bit and see what happens. Whatever we collect over the year will be summarized and recorded on one paper for 2013. Want to start a new tradition? 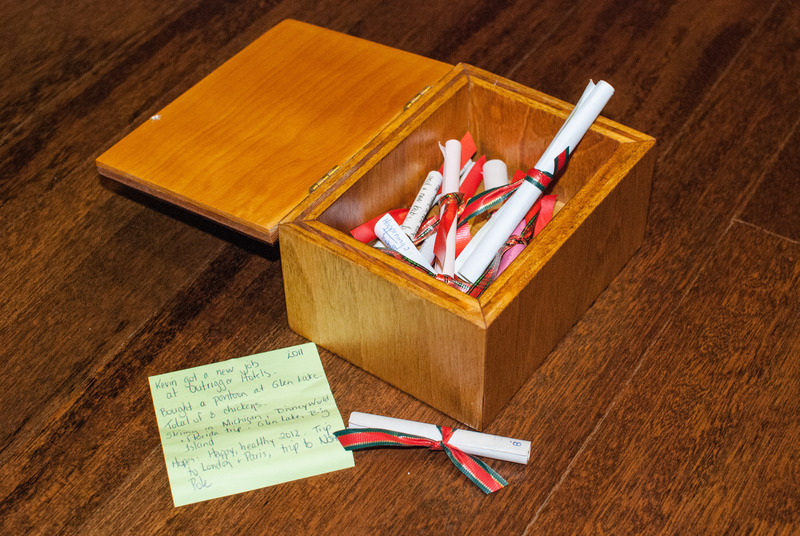 Try the wish box, as even the smallest members of the family can participate. You don’t need a handmade wooden box from your brother – any vessel will do. Get fancy and use special paper or make it easy and use post-it notes. I usually record a few significant events and make a few predictions and wishes on one piece of paper, then roll it and secure with a ribbon. Once rolled, I write the year in the corner so I can find it easily next year. Traditions and memories are wonderful ways of keeping loved ones, near and far, in your life. Some of ours are now in the 4th generation, others are brand new. Some we’ll keep and others might fall to the wayside. I know my kids look forward to each and every one. The time we spend together working on them is pretty much the definition of holidays to me. 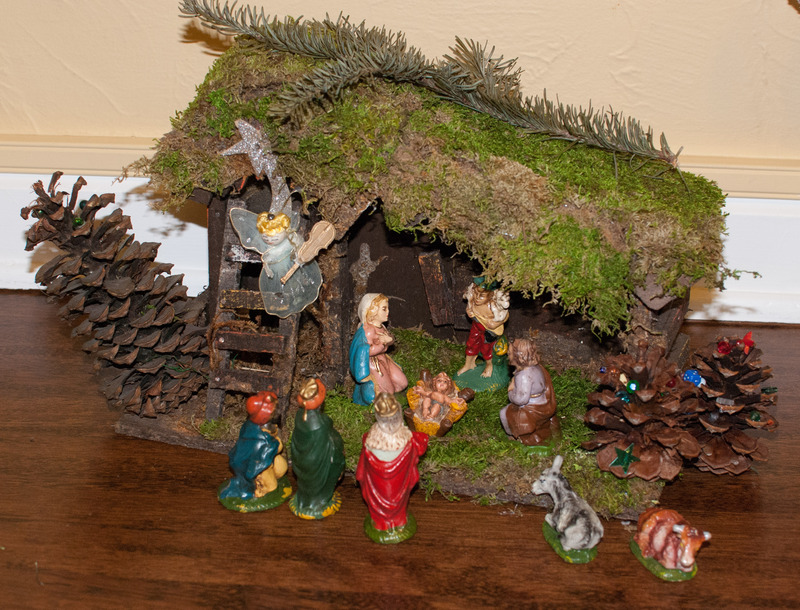 This entry was posted on January 20, 2013 by mdaucello in Christmas, Holidays.